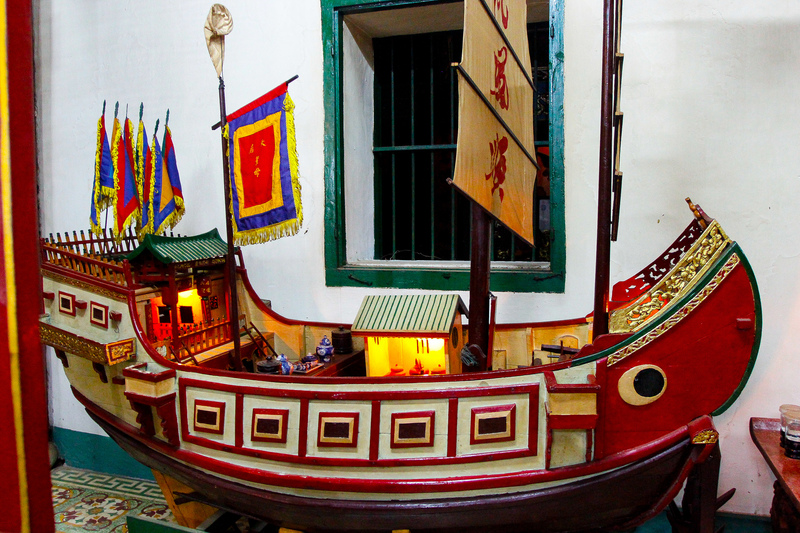 This story is illustrated in the two huge embossments hung near the main door of the hall and the model of a boat symbolising the initial journey to Vietnam. The building also served as an assembly hall for the Fukian community – the biggest Chinese community in Hoi An at that time. The three-entrance gate is a beautiful structure covered with blue enamel tube-tiles. Visitors might also notice that symbols of sacared animals such as fish, dragons, unicorns, phoenixes and turtles are featured quite a lot in the design and architecture of the Phuoc Kien Assembly Hall. These symbols profoundly reflect the Oriental philosophy that values achievement, power, endurance, knowledge and nobiliy. The main hall houses the statues of Avalokitesvara sitting in mediation, Thien Ly Hau Holy Mother, the God of Thien Ly Nhan Thien Hau (thousand-mile vision) and the God of Thuong Phong Nhi (thousand-mile hearing). In the centre of the back sanctuary are the statues of the three most famous Kings of the Ming Dynasty and the six generals in the family who died in the fight for the restoration of the dynasty. The right altar in the back sanctuary is dedicated to the three Sanh Thai goddeses and 12 midwives who are said to teach newborns basic skills such are sucking and smiling. As a result, couples keen to have children often visit Phuc Kien Assembly Hall to pray for children. On the other hand, merchants who wish wealth and luck usually worship the God of Wealth whose statue is located in the left altar. Nowadays, Phuc Kien Assembly Hall is one of the most popular tourist sites in Hoi An. Visitors come here not only to explore a beautiful work of architecture but also to participate in many annual events and activities to celebrate Chinese festivals when the assembly hall is in its full glory. To view more photos from Phuoc Kien Assembly Hall in a full-size gallery please click this link.